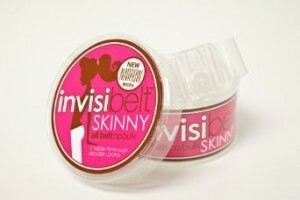 Is the Invisibelt really invisible? We test it! Today’s post is written by the new FBG in the house: Kelsey Brazelton! Kelsey is FBG’s official intern and an all-around sweet girl with a background in journalism and a love of running and food. (You can see why she fits in so well, eh?). Please give her a warm welcome readers—you’ll be reading more from her in the future! As much as we try to beat the body-image blues, we women are self-conscious about our bodies at some point or another in our lives, right? After all, it’s human to want to put your best foot forward—including your best look. And having a big, bulky belt popping out from under your sweater isn’t always the most of flattering looks. That’s where the Invisibelt claims to help. It says it will hide under fitted tops and be able to hide any muffin top you might have going on. I recently tried the Invisibelt, testing it under a number of clothing options. The results? Well, it’s certainly not the most comfortable thing I’ve ever worn; the plastic is kind of hard and doesn’t really shape well with your body. Also, the main selling point of the belt is that it’s invisible, but I found that when wearing it, the adjustable part still poked out of my shirt. The snaps on the belt were definitely less noticeable, but still popped up a bit under fitted tops. And the slimming effects? Eh, not so much on me. I figure if I want to wear a belt, it’s going to be because I want a belt on and for it to show, not because I want it to disappear. But that’s just me. While it adjusts from sizes 0-14 (a good range, for sure), Invisibelts for Plus Size women and young girls are also available. The belt goes for $22, which seems pretty high to me. While it is less visible under a longer shirt than a usual belt is, if your goal is to smooth your profile, I would venture to say that traditional shapewear would probably take care of that issue and fit under clothing much better than the Invisibelt. Although, at least the Invisibelt doesn’t make sure you feel like a sausage…so there is that. I love mine. I wasn’t aware that it claimed to get rid of muffin top – I think that’s a pretty hefty claim, and it definitely doesn’t make you look any skinnier/slimmer than you actually are. I got it to avoid the “belt bump” that I get under longer t-shirts. I don’t always wear a belt to show – I mean, usually they’re just something I need to keep my clothes fitting correctly, like shoelaces or something. Anyway, I think it’s great because it doesn’t give me a phantom gut roll that my other belts do. I’ll definitely agree that it’s not the most comfortable belt in the world, though. I have several and like the girl sizes the best. I have a small waist and buy girls sized pants,skirts, but they are still large in the waist. The girls belts were only $5 and I bought a black and clear woman’s size belt as well. Now they have the skinny, 1 inch belt which I would have liked since the women’s belts are so big. I like the clear woman’s belt and white, pink, and purple girls belts the best. Shipping is expensive so if you can get on their newsletter when they’re having a special, and order a few together, it’s a savings. Otherwise, yes I agree, the woman’s sizes seem overpriced. I make some of my own belts though, so I’m biased! I love mine as well – but more for holding pants up that are slightly loose (trying to lose weight, you know) and just need a little extra help. When I wear a ‘normal’ belt and want to wear a longer shirt, the normal belt pops out and looks funny. I did find the invisibelt to be smoothing in that regard. I am a big fan. they do have good sales on their mailing list. usually like 2-3 a month. i hate when my belts bulge out and i never tuck my shirts in. for those of us who dont want any extra inches, they are really good.